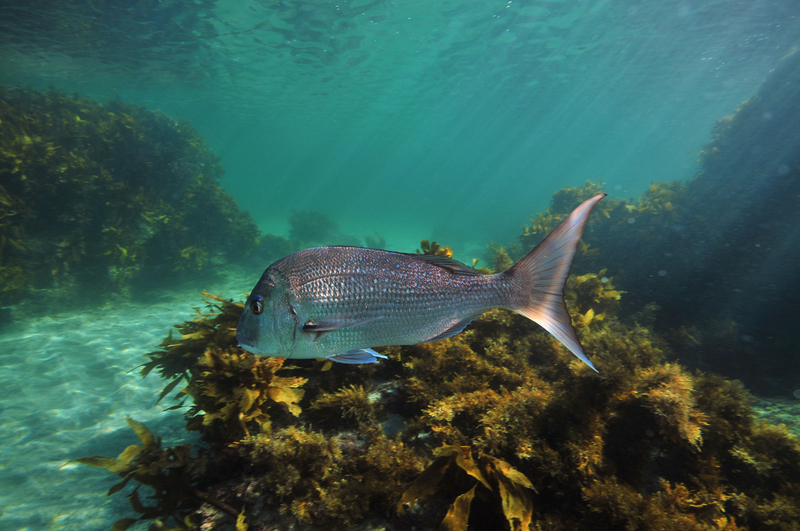 New Zealand’s first marine reserve doesn’t just protect snapper inside the reserve, it also acts as a snapper super-nursery, contributing ten times more fish than expected to the surrounding areas. The findings come from a new study examining the genetic relationships between fish inside and outside the boundaries of the Goat Island Reserve – a Marine Protected Area (MPA) north of Auckland. At least 11 percent of juvenile snapper up to 40km away are the offspring of spawning adults from the reserve, according to the research published today in Proceedings of the Royal Society B. The research was jointly undertaken by the University of Auckland and Massey University. “The contribution from the reserve is about 10 times higher than would be expected if snapper larval contribution was simply proportional to geographic area,” says author Professor John Montgomery, who led the research with Dr Shane Lavery, and former University of Auckland postdoctoral fellow Dr Agnès Le Port. The Goat Island Reserve is New Zealand’s first MPA, established in 1975 and covering just 5.56 km2 of coastal ocean (it is also conveniently located on the doorstep on the University’s Leigh Marine Lab – check out the 3D map to the right). Plenty of research shows that MPAs like this help to protect fish inside the reserve, but data showing how reserves contribute to surrounding fish populations is sparse. There have been some studies investigating reserves in tropical waters, but until now scientists didn’t have much information about reserves in cooler temperate waters. Undeterred, the researchers collected DNA samples from snapper larvae and hundreds of juvenile and adult snapper in the reserve and a surrounding 400km2 area. Through genetic comparisons, they were able to determine parent-offspring relationships between fish. Combining their results with overall estimates of the number of snapper in the area and hydrodynamic ocean models, they arrived at a final figure: approximately 11 percent of snapper swimming about outside the reserve came from parents in the reserve. We expect that the magnitude of this MPA’s contribution to the local fishery (estimated to be approximately 11% of the juvenile population across an area 100 times that of the reserve) is more than enough to make up for losses to the fishery associated with closing this area to fishing. We encourage such models to be used to design systems of MPAs that optimize their contribution to fisheries, thereby achieving the elusive win-win scenario for conservation and fisheries management.